The German Army captured a number of French vehicles after the fall of France, which were pressed into service either in their original roles, or after being rebuilt to a different purpose. 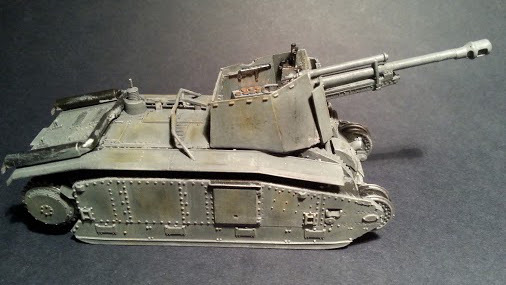 This must have created a nightmare for maintenance units, but provides a goldmine for modelers who prefer odd-looking vehicles. 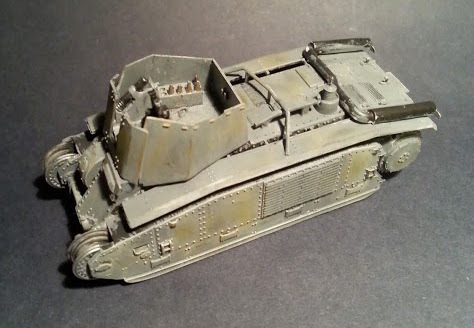 This ModellTrans conversion was designed for the excellent 1/72 Trumpeter Char B kit. It comes packed in a blister pack which should make shipping and handling a relatively safe process for the resin parts. (Some of the smaller parts did break off from their casting blocks during shipping, and the thin resin armor shields were chipped, unfortunately.) It consists of 21 well-cased resin parts, all of which have good detail, and very few casting imperfections (the notable exception is the muzzle break). As usual with resin conversions the kit does not come with detailed instructions. What you get is a few color photographs of the assembled kit, and a drawing of the Trumpeter hull showing where to cut the plastic away. Most of the parts make up the gun itself, which is the most difficult part of the assembly. (Reference photos of the gun will come very useful as the photos of the assembly provided are not very clear.) The quality of the gun barrel is good enough (no warping, no bubbles), but the muzzle break does have casting issues. The liquid resin got into the cavities, filling them up. I did my best to clean it up, but it is difficult to hollow it perfectly. The armor plating which protects the fighting compartment is very delicate, and careful handling will be required. The fighting compartment was a headache. This conversion provides a flat surface with no-slip pattern, which can be installed easily enough. However, I cannot comment on the historical accuracy. I was unable to find reference drawings or photos of the actual vehicle's fighting compartment. What I found was that different conversion sets/scratch-built conversions picture this area differently. Some are open to the driver's compartment; some are completely sealed off, just like this conversion. One thing is for sure: it would probably need a radio set, and a few storage boxes. The building time with cleanup is literally two hours; most of which will be spent with the assembly of the gun, and the modification of the Trumpeter hull. This is a very fast and easy conversion. Armory has a similar conversion kit which uses PE parts for the armor. But it costs more and personally I don't really like using photo-etched parts, mostly because I'm not very good with them. Competition is good, however, because it gives us choices: an easy and cheaper resin, or a more difficult, and more expensive mixed conversion set.